In order to use a vCAC vSphere template with Application Director, you must install the Application Director agent on your VM. 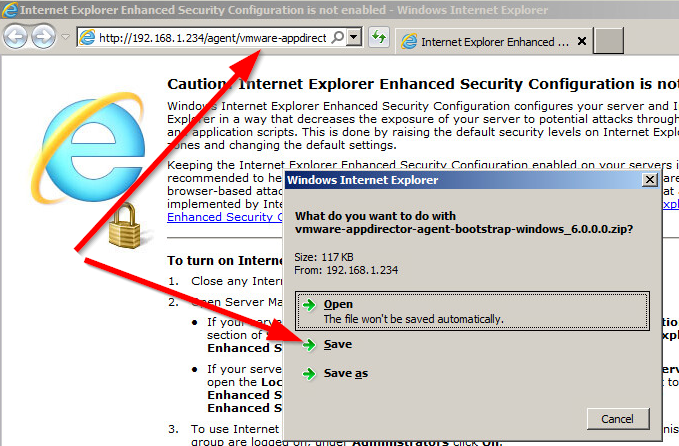 In this example, I have created a VM with Windows 2008 R2 that already has the vCAC guest agent installed. I will show how to add the Application Director agent and then prepare this for use with a linked clone vCAC vSphere blueprint, which can then be used for an Application Director OS template. IF YOU HAVE ALREADY installed the vCAC guest agent (gugent) then you will need to uninstall the guest agent as a service (stop the service and then run sc delete VCACGuestAgentService). 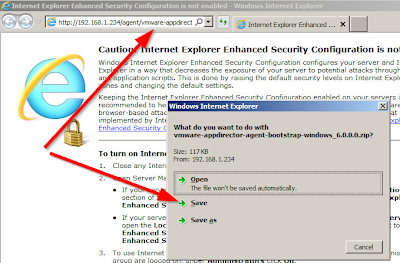 The Application Director agent bootstrap install will configure the vCAC agent as part of the installation process. Obtain the vCAC guest agent install and unzip it to the c:\VRMGuestAgent folder but do not install the agent as you normally would. The Application Director agent bootstrap install will do this for you. If you are interested, this file can be found in the path /home/darwin/tcserver/darwin/webapps/darwin/agent on the appliance (as well as all the other agent files). 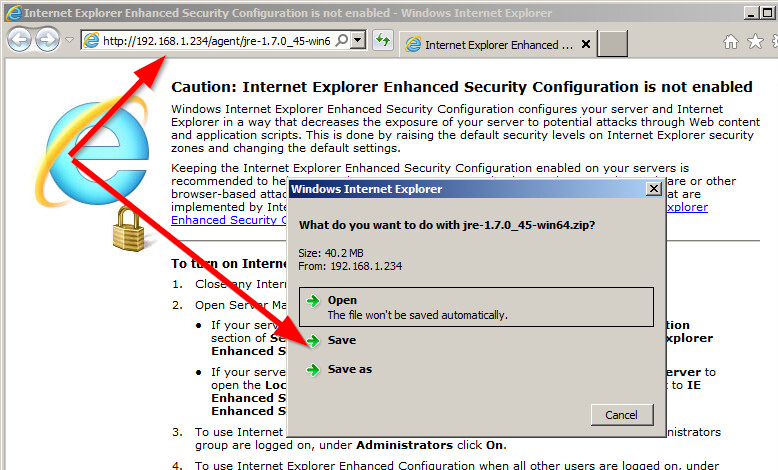 I simply used IE to grab the file. Extract the agent files to your c:\windows\temp folder. 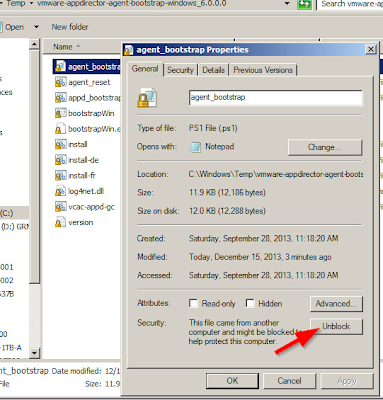 You will need to disable security on the agent_bootstrap.ps1 file by right clicking the file, selecting properties from the context menu and then clicking "Unblock" and then "OK"
Now, for the next step you have a couple of choices in how to proceed. The agent bootstrap service needs to run as the local "darwin" user account (this is created by the install.bat - you don't need to create it). The install.bat will actually take care of this for you, but you will need the NTRights.exe utility from Microsoft, which is included in the Windows Server 2003 Resource kit. Simply download the resource kit, install it and then place the NTRights.exe file in the same folder as the agent bootstrap install files. The install.bat will take care of the rest. 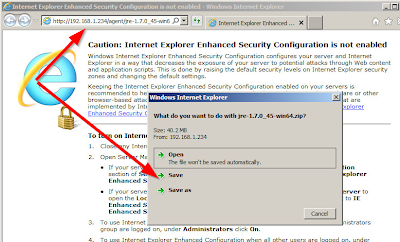 Otherwise, you can skip the NTRights utility and the install file will simply instruct you to perform this task manually. This is what I elected to do for my install example. The password value is used to set the password for the local "darwin" account which will be created to run the agent bootstrap service. The cloudProvider should be set to vcac. The vcacServer value is the FQDN for the Windows server running the vCAC 6.0 IaaS model manager. 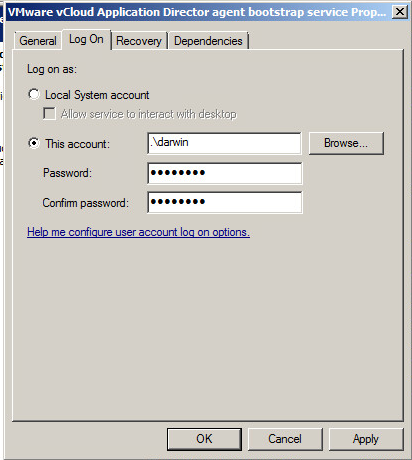 nting darwin user the privileges to run the bootstrap service. - Run services.msc to bring up the Services management console. - Open "VMware vCloud Application Director agent bootstrap service"
enter ".\darwin" as the account name and enter its respective password. al steps to complete the installation. 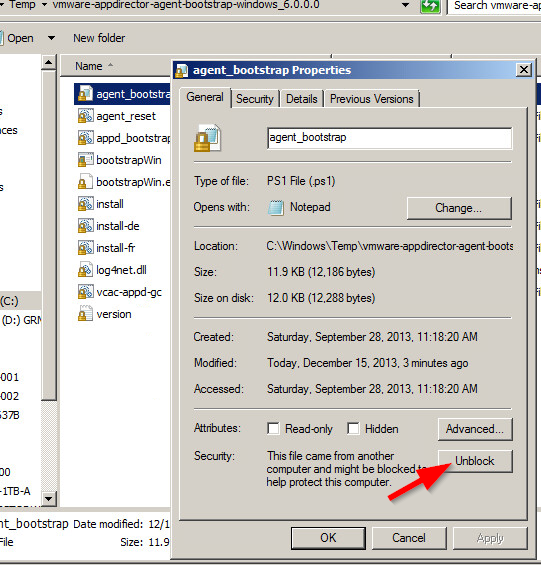 You will find that the install.bat created a new folder under c:\opt for the bootstrap agent. Installation log output can be viewed there if you need to troubleshoot. Open services.msc and adjust the log on settings for the VMware vCloud Application Director agent bootstrap service to use the "./darwin" account and set the password to the value used in the install.bat parameters. At this point you can shut down the guest OS on your VM and after the VM is powered off, I will make a snapshot to use with my vCAC blueprint specifically for Application Director OS templates. Check the /home/darwin/tcserver/darwin/webapps/darwin/agent directory before trying to download. The currently version is 1.7.0-72-win64.zip and the documentation days 1.7.0-51-win64.zip. If you are getting an invalid zip file error when trying to extract confirm versions.